Taking place in the early 1960’s…..the CIA and KGB learn that a terrorist organization (THRUSH) has developed an atom bomb. Teaming up to find the bomb and grab the computer disks (actually, tapes) detailing it’s construction the KGB assigns agent Illya Kuryakin (Armie Hammer) and the CIA assigns Napoleon Solo (Henry Cavill). Unbeknownst to either agent, their respective governments tell each to kill the other to get the tapes. 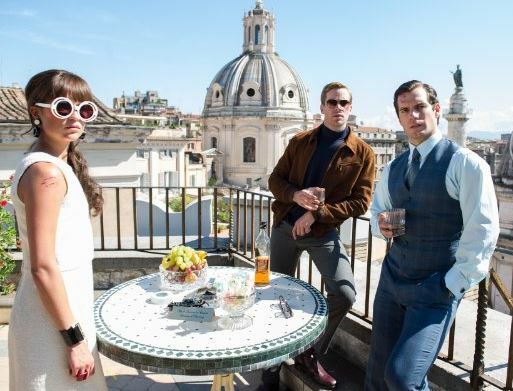 “The Man from U.N.C.L.E.” is a fun spy action flick. It is a prequel to the TV show of the same name from 1964 to 1968 and as such, it is only at the end of the movie that the United Network Command for Law and Enforcement is formed with the first two members: Solo and Kuryakin. I don’t remember any cuss words so it should be good for the entire family. The violence is not graphic. I kept thinking Cavell was going to duck into a phone booth…..but he never did. Go figure. For more information go to IMDb for more information.